Daryus Gaunt used to be a crusader, battling to protect civilization from the demons of the Worldwound, before a battlefield mutiny forced him to flee or be executed. Pathfinder Shiera Tristane is an adventuring scholar obsessed with making the next big archaeological discovery. When a talking weasel reveals that a sinister witch is close to uncovering a long-lost temple deep within the Worldwound, the two adventurers are drawn into the demon-haunted lands in order to stop him from releasing an ancient evil. Now both fame and redemption may be at hand... if they can survive. From New York Times bestselling author Richard A. Knaak comes a novel of exploration, betrayal, and deadly magic, set in the award-winning world of the Pathfinder Roleplaying Game. I liked this pretty much. Though I'm becoming less enamored of the Tales model of "chapter 1 for character A, chapter 2 for character B", what was interesting here was that sometimes you were reading from the perspective of the villain. Not something you see every day. Lots of twists and characters to keep you interested, and I have to say the main twist near the end--involving the "Reaper"--was unexpected and cool. I always like when something plays out against type. Minor criticisms...well, as is all too common, the editing of these books. I'm getting too good at filling in missing words, correcting typos, and mentally removing extra words. Also, while I enjoyed the "talking weasel" character quite a lot, naming it "Toy" was a distraction I didn't want. Bonus points for hinting at the real BBEG w/ a simple coin description. That was cool; didn't spell it out but didn't need to...if there were ever a sequel, I would hope that would be explored more. EDIT: another criticism of sorts. Why have the villain a PF "witch", a distinct class that exists in the game, but not have a single hex thrown around. I get that the patron was punishing him, but why not simply make him a more standard spell caster? I had a stab of nostalgia, seeing Knaak's name, as I devoured his Dragonlance books in the early nineties as a kid. Those were fond memories, but based on this novel I fear like much of the Dragonlance canon, those books wouldn't stand up well to the test of time. Knaak is exceedingly obvious as a writer. He tells you *absolutely* everything - the first few pages are a rare "characterisation info dump", and the book doesn't really improve much beyond this. Everything the characters feel or think is told you as a reader. Often the same thing is told multiple times, in just one chapter. There is nowhere near as much telling and it renders the characters flat and their arcs predictable. The attempts at mystery are disappointingly transparent. You'll see where the book is going within the first thirty pages. And this drains much of the excitement from the ensuing narrative. Much like the previous tale, Shy Knives, I felt like Knaak wasn't really familiar with Golarion or the Pathfinder world. Another book about the Worldwound and surrounding area was not really necessary - especially when it's been done so much better before by Dave Duncan. What Knaak delivered felt... patchy, incomplete. The world only existed to move the characters from point A to point B. For me, the top Tales writers are Liane Merciel, Chris Jackson, Tim Pratt, James Sutterand Howard Andrew Jones, Dave Duncan. Those books are insta-buys for me. This fell far, far short and I'm a little worried editorial quality is slipping a bit. Paizo took gambles fresh writers previously which delivered very enjoyable books (though those writers haven't come back, much to my disappointment), this is a gamble that didn't pay off in my estimation. PS also the names were terrible. "Daryus Gaunt"?! Why not call him "Max Steele" for goodness' sake! I hate to be so negative, but this was probably the novel with the weakest writing of the whole series so far. A better author would have needed 100 pages less to tell the same story. A powerful witch has crossed his demonic patron on his quest for power and tries to escape his former patron's wrath. His former familiar opposes him on his quest for a new, more powerful patron. It's not at all about the stereotypical heroes, which the author had to introduce for some reason. Their involvement in the story makes little sense from the start and becomes more and more implausible as the story continues. The whole narrative really suffers from it. Focusing on the antagonist (the author's not-so-secret favorite and clearly the most interesting character) would have turned this into a way better story. This is another novel that is very light on Golarion lore and flavor. I get that I cannot expect every author to become as familiar with Golarion as the people who wrote the setting, but the main reason why I'm interested in these novels is that, if done well, they make the Inner Sea region come alive. Aside from Wesley Schneider and James Sutter, authors like Dave Gross and Liane Merciel have been my favorites so far precisely for that reason. I hope that future authors take some notes. Unless you like one-dimensional characters, longwinded combat descriptions, and an implausible storyline, stay away. Archeological adventure in a demon plagued wasteland! I've long been a fan of Knaak's work, so I was thrilled to see him come to the Tales line. Nor was I disappointed. I read Reaper's Eye within 24 hours of purchase, and enjoyed it thoroughly. Highly recommended. I remember Knaak! Loved some of his old Dragonlance novels! Once we get more information on this one, I may have to add this to my list. I liked Knaak previous books so I am looking forward to this. I've liked Knaak's Dragonlance and original work, looking forward to him in the Pathfinder world as well. He's also the first author I ever got to sign a book. OR...not so sadly, since it would mean there are more books out there I hadn't yet read, by a writer I know can do the job to my satisfaction. In the end, that's what I like about this - he's a writer whom I've enjoyed in the past, so the chances are high of this book being something I'd enjoyed spending time and money on. Because that's how my life goes. You forgot to add Badumptish! Ah, his minotaur character in Dragonlance was memorable. Left an impression even though I read it 30 or more years ago. Ah, his minotaur character in Dragonlance was memorable. Extremely excited for this, I have many fond memories of reading Mr. Knaak's works, Kaz is very much a part of those fond memories. Yeah, many fond memories of "Legend of Huma" and "Kaz the Minotaur." If RIchard is even anywhere close to his level of awesome in those DL offerings, then this is going to be an amazing book! And but of course, why wouldn't he be. Are those Hucueva's that are getting headshoted? Shure looks like it - good eye. This is the first book that excites me without a description - the cover is enough! One repeating crossbow and a shortbow vs. 7 undead at close quarter. And only 2 bolts left! Ditto this in almost every detail!!! Link to Macmillian's description. And the next two are Through the Gate in the Sea, by Howard Andrew Jones (ETA February) and Gears of Faith, by Gabrielle Harbowy. The fallen crusader bit has been done in Pathfinder Tales already (via Paizo's short story web fiction). I'm not expecting much from this. Ah, but has it been done by Richard Knaak?! Try reading his Dragonlance work--probably the best DL writer outside of Weis/Hickman. Oooh, me likey. The author caught my attention. This description just reeled me in. Fool! I am the weasel! How come this doesn't show in my subscription though? I hate to be so negative, but this was probably the novel with the weakest writing of the whole series so far. Focusing on the antagonist (the author's not-so-secret favorite and clearly the most interesting character) would have turned this into a way better story. Unless you like one-dimensional characters, longwinded combat descriptions, and an implausible storyline, stay away. Will there be a boon sheet for the latest 4 in this series? I am also curious if there will be an associated chronicle sheet. 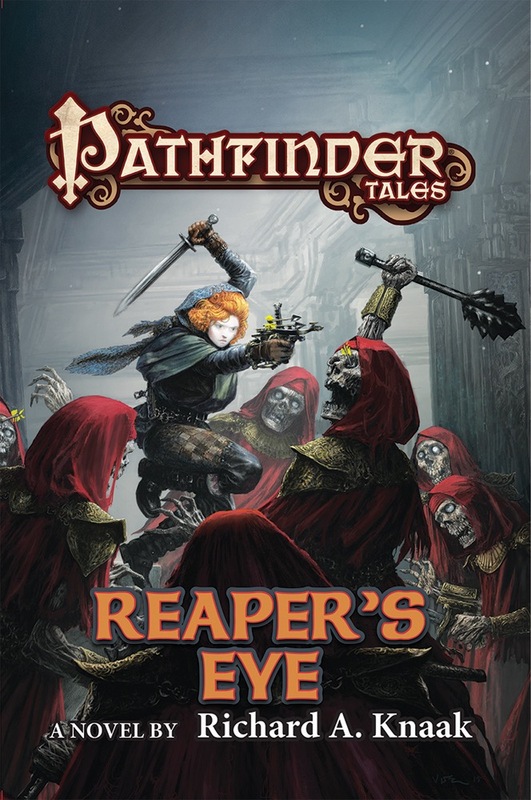 I have noticed that the newer books don't have the pathfinder tales chronicle sheets. Although I enjoy reading the books, it was always an awesome bonus that there was also some incentive associated with Pathfinder Society.